Mukherjee Nagar in north Delhi is home to a large number of civil service aspirants. Katwaria Sarai is preferred by students trying to crack the engineering and medical entrance exams. And chartered accountants? Well they seem to prefer Laxmi Nagar in east Delhi. 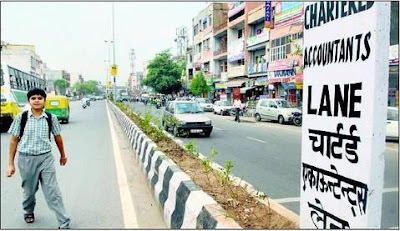 So much so that the stretch between Laxmi Nagar and Mother Dairy crossing was recently renamed Chartered Accountant’s Lane. With approximately 5,000 practising CAs and over 15,000 students pursuing the course residing in the locality, the move hardly comes as a surprise. The students and CAs living in the area feel the move was long overdue. ‘‘One fine morning I saw the lane being renamed. The majority of CA students live here because of the strategic location. It is home. Most of us have been here for at least three or four years. Rented accommodation or hostels are where you will find us. Once you arrive in Laxmi Nagar, you get to know everything about the CA course,’’ says Ashwani, a CA (final) student from Darbhanga in Bihar. Laxmi Nagar and Shakarpur are home to a large number of outstation students. Close to 100 hostels for boys and girls have come up in the past 10 years and some of them don’t even allow non-CA students. Though for the last decade students from Bihar and UP had been in the majority, of late there has been an influx of aspiring CAs from Haryana, Punjab and Rajasthan. This corner of east Delhi has everything going for outstation students — from affordable accommodation to the coaching centres with high “strike rates”. ‘‘These two blocks are close to the CA institute. All other facilities including the library and coaching centres are within walking distance. There has been quantum jump in the inflow of students in the last 5-6 years,’’ says CA Rajesh Makkar, who runs one of the most successful coaching classes in Laxmi Nagar. Catering to the burgeoning demand, some tutors have started taking classes in nearby auditoriums including Pyarelal Bhawan and Andhra School in ITO and also at the FICCI auditorium. ‘‘Everything related to chartered accountancy is either available in this locality or is nearby. Laxmi Nagar and Shakarpur is home to almost 80% of Delhi’s CA students. Even landlords prefer students,’’ says Prince, another CA (final) student. Although many locals like businessman Karan Singh Negi are against the idea of renaming a road after the CAs, he nevertheless agrees that the huge influx of students has pushed up rents. ‘‘When people in this locality add new rooms, they design them for outstation students,’’ says a local property dealer. However, the renaming has not been without political heartburn. Few days after the stretch was renamed in the presence of MCD’s Shahdara south zone chairman Ravi Prakash Sharma, local councillor Lata Gupta opposed the step. ‘‘I was not even aware of anything like this. I have raised the issue in the House. Roads should be named after great leaders. The plaques installed would be removed soon. I don’t mind if the stretch is named after a great economist or CA,’’ the councillor says. It is good that the new name of this lane is dedicated to the chartered accountants.